I stumbled across this recipe when flipping through a Rachael Ray magazine and jotted it down to try sometime. With a couple days off this weekend and the possibility of springier weather, I decided to give it a try. And Yum!!! Jeremy said this was better than ice cream or vanilla yogurt (both of which he is quite a fan). I say, this recipe is delicious and simple, coming together in about 15 minutes. And, I'll let you in on a little secret, I cut back on the sugar. I put 4 Tablespoons of sugar in the custard and 2 Tablespoons of sugar on the strawberries. I also used 1/3 cup heavy cream and 2/3 cup 1% milk in place of the half and half. And I subbed in about 1/3 cup plain yogurt in place of all sour cream. I've included the original recipe below, but feel free to mess around with it as it suits your needs. 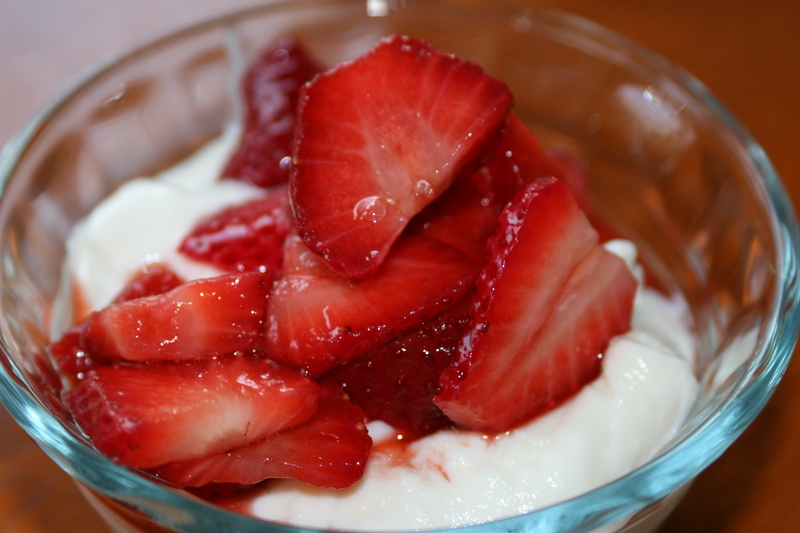 This makes a perfect dessert during strawberry season. It's elegant enough for company, but easy enough just to whip up a batch for the family. I hope you enjoy this as much as we did! In a small saucepan over medium heat, heat the half and half with the 6 Tablespoons of sugar, stirring until the sugar has melted. Whisk in the vanilla and the softened gelatin, then whisk in the sour cream. Transfer to a bowl and refrigerate until set, about 2 hours. Meanwhile, toss the sliced strawberries with the 3 Tablespoons of sugar and the balsamic vinegar. Cover and refrigerate. Top the custard with the balsamic strawberries. Serves 4.